Ashdod (Hebrew: אַשְׁדּוֹד‎; Arabic: إسدود, Isdud), located in the Southern District of Israel on the Mediterranean Sea coast, is a city of over 200,000 people located approximately 43.5 miles (70 km) from Jerusalem and Beer Sheba. Ashdod is an important regional industrial center. The Port of Ashdod is Israel's largest port, and is southern Israel's only outlet to the Mediterranean. The artificial port, enclosed by breakwaters, accounts for 60 percent of the country's imported goods, while much of the country's citrus crop is exported through it. Modern Ashdod was established in 1956 on the sand hills approximately 4.5 miles (7 km) north-northwest of the ancient archeological site, on the recent ruins of the Palestinian village of Isdud. It was incorporated as a city in 1968, with a land-area of approximately 23.2 square miles (60 sq km). Being a planned city, expansion followed a main development plan, which facilitated traffic and prevented air pollution in the residential areas, despite population growth. According to the Israel Central Bureau of Statistics, Ashdod had a population of 204,400 at the end of 2006, making it the fifth largest city in Israel. Though the modern city of Ashdod takes its name from the ancient site 4.5 miles away, it is actually built on the recent ruins of a Palestinian village. In 1953, surveyors and designers arrived at the desolate dunes near the mouth of Lachish River to choose a site to build a new power station in the south of the country (eventually "Eshkol A"). Its workers lived in the regional settlements Rehovot and Gedera. On May 1, 1956, then finance minister Levi Eshkol approved the establishment of the city of Ashdod. The first settlers, 22 families of Jewish immigrants from Morocco arrived in November 1956, and a group of immigrants from Egypt joined them. In July 1957, the government granted a 24,000 dunam (24 km²) concession, approximately 32 km from Tel Aviv, to the Ashdod Company Ltd., for building the modern city of Ashdod. The building of the Eshkol A power station in Ashdod was completed in 1958 and included three units: two units of 50 MW, and one unit of 45 MW (with the ability of sea water desalination). The first local council was appointed in October 1959. Dov Gur was appointed on behalf of the Israeli Ministry of Interior as the first local council head. The building of the Port of Ashdod began in April 1961. The port was inaugurated in November 1963, and was utilized for the first time in November 1965 with the coming of the Swedish ship Wiengelgad. The Magistrates' Court in the city was inaugurated in 1963. In 1964 the Ponevezher Rov, Rabbi Yosef Shlomo Kahaneman established the Ponevezh development, the first Hareidi neighborhood in Ashdod. In 1978 a joint Belz (Hasidic dynasty)|Belz-Ger (Hasidic dynasty)|Ger estate was established in Neighbourhood 3 (Rova Gimel). The Lev Simcha Talmud Torah in Ashdod is the largest cheder (traditional elementary school teaching the basics of Judaism and the Hebrew language) in Israel. Today, the Tolna Rebbe, Pittsburgher Rebbe, Neshchiz, and Melitzer Rebbes reside in Ashdod. The development of the city over the years followed a main development plan. The planners divided the city into 17 neighborhoods of ten to fifteen thousand people each. Wide avenues between the neighborhoods make traffic flow relatively freely inside the city. Each neighborhood has easy access to its own commercial center, urban park, and health and education infrastructure. The plan also called for a central business and administrative center, but this had to wait until the mid-1990s when the city population grew rapidly, more than doubling in ten years. Three industrial zones were placed adjacent to the port in the northern part of the city, taking into account the prevailing southern winds which take air pollution out of the city. The plan had its problems, however, including asymmetric growth of upscale and poorer neighborhoods and the long-time lack of a main business and administrative center. The city was planned for a maximum of 250,000 inhabitants, and an additional area in the south was reserved for further development. However, the southern border of the city was proclaimed a national nature reserve, Ashdod Nitzanim Sand Dune Park, which makes future city growth problematic, with the last of the 17 neighborhoods of the development plan now under construction. Ashdod, like many Israeli cities, has seen most of its growth as the result of absorption of immigrants. The first major group to move to the city were Jews of Moroccan and Egyptian descent. In the 1960s Ashdod accepted a large number of immigrants from Romania, followed by a large number from Georgia and India in the 1970s. During the 1990s the city also absorbed a large number of Jews of Ethiopian descent, and in more recent years the city has seen an influx of Jewish immigrants from France and Argentina. Ashdod also receives a significant amount of internal migration, especially from the Gush Dan region. Ashdod in the early nineteenth century. Nicolas Poussin (1594-1665), French. The Plague of Ashdod, 1630. Oil on canvas, 148 x 198 cm. Musée du Louvre, Paris, France, Giraudon/Bridgeman Art Library. Human settlement in Ashdod dates from the Paleolithic Age. Ashdod is mentioned in Ugaritic documents, the language of the ancient Canaanites. At the end of the thirteenth century B.C.E. the Sea Peoples conquered and destroyed the city. By the beginning of the twelfth century B.C.E. the Philistines, generally thought to have been one of the Sea Peoples, ruled the city. During their reign, the city prospered and was a member of union of five Philistine city states. Asdûdu led the revolt of Philistines, Judeans, Edomites, and Moabites against Assyria after expulsion of king Akhimeti, whom Sargon had installed instead of his brother Azuri. The city of Gath (Gimtu) belonged to the kingdom of Ashdod at that time. An Assyrian general, Tartan, gained control of Ashdod in 711, ("In the year that Tartan came unto Ashdod, when Sargon the king of Assyria sent him, and fought against Ashdod, and took it" : Isaiah 20:1) and forced the "usurper" Yamani to flee. Mitinti was king at the time of Sennacherib, and Akhimilki in the reign of Esarhaddon. Psammetichus of Egypt is reported to have besieged the great city Azotus for 29 years (Herodotus, ii. 157); the biblical references to the remnant of Ashdod (Jeremiah 25:20; cf. Zephaniah 2:4) are interpreted as an allusion to this event. The city absorbed another blow in 605 B.C.E., when Nebuchadnezzar conquered it. In 539 B.C.E. the city was rebuilt by the Persians, but was conquered in the wars of Alexander of Macedon (Nehemiah 13:23). The city prospered as Izotus under the Hellenistic rule, until the Hasmonean Revolt. During the rebellion Judas Maccabeus arrived at its gates, but did not conquer it. He left it for his brother Jonathan, who conquered it in 147 B.C.E. and destroyed the Temple of Dagon. According to Flavius Josephus (Antiquities of the Jews 13 (15), volume 4), Alexander Jannæus possessed it. Pompey restored its independence by reconstructing its city walls, though it belonged to the dominion of Herod and Salome (Antiquities of the Jews 17(18), volume 9), and Vespasian had to later take it by force. Despite its location four miles from the coast, both Ptolemy and Josephus described it as a maritime city. This curious description may refer to Ashdod's control of a separate shore-edge harbor, called Azotus Paraliyus, or Ashdod-Sea (Antiquities of the Jews 13(15) volume 4). The city's prominence continued until the seventh century, when a citadel was built in Azotus Paraliyus as a stronghold against the Byzantine navy. To the west of the wooded height on which the city stands, traces of the ancient harbor—now known as Minet el-Ḳal'a—can still be seen. According to the bible, during the 10th century B.C.E. Ashdod became, along with all the kingdom of Philistia a patronage area of the Kingdom of Israel under the control of King David. 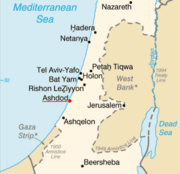 Judah's claim upon Ashdod is mentioned in the Book of Joshua (Joshua 15:46). In the Book of Samuel Ashdod is mentioned (I Samuel 6:17) among the principal Philistine cities. After capturing the Ark of the Covenant from the Israelites, the Philistines took it to Ashdod, where it was placed in the temple of Dagon. The next morning Dagon was found prostrate, bowed down, before it; on being restored to his place, he was on the following morning again found prostrate and broken. The people of Ashdod were smitten with boils; a plague of mice was sent over the land (1 Samuel 6:5). The capture of the city by King Uzziah shortly after 815 B.C.E. is mentioned within the text of the Book of Chronicles (2 Chronicles 26:6) and in the Book of Zechariah (Zechariah 9:6), speaking of the false Jews. The Ashdod City Council has twenty-five elected members, one of whom is the mayor. The mayor serves a five-year term and appoints six deputies. Within the city council there are various factions representing different population groups, both secular and religious. The headquarters of the Ashdod Municipality and the mayor's office are at city hall. The municipal building is located in the main culture and business area. Ashdod is one of the most important industrial centers in Israel. All industrial activities in the city are located in northern areas such as the port area, the northern industrial zone, and around the Lachish River. The Port of Ashdod is the largest port in the country, handling about sixty percent of Israel's port cargo. Various shipping companies offices are also located in the port area which also is home to the Eshkol A power station and coal terminal. The Northern industrial zone includes various industry including an oil refinery, which is one of only two in the country. The heavy industry zone located south of the Lachish River was once the main industrial center in Ashdod. Recently, however, leisure facilities have moved into the area. There is still some industry here, however, such as a Teva Pharmaceutical Industries plant, construction components producer Ashtrom, and Solbar, a soybean oil producer. Ashdod is also home to Elta, a part of Israel Aircraft Industries where radar equipment, electronic warfare systems, and ELINT are developed. Ashdod is located on the historic Via Maris, one of the most important trade routes in the Middle East during ancient times. Israel's Highway 4 was developed following this route along the southern sea shore it serves as the main connection to the north, towards the Tel Aviv metropolitan area, and to the south, towards Ashkelon. The other main road in the area is Highway 41 which served the city from the start of its modern history. This road runs from west to east towards Gedera and it is the main transport link to the Port of Ashdod and the industrial zones, and connects to Highway 4 with an interchange. The passenger railroad connection to Ashdod opened in 1992 following the renovation of the historical railway to Egypt. Ashdod railway station is on Israel Railways' Binyamina/Netanya - Tel Aviv - Ashkelon line and it is located near Ad Halom Junction. There is also heavy freight traffic in the area. Port of Ashdod has its own railway branch line as well as a special terminal for potash brought from the Sodom area and exported abroad. The Port of Ashdod has a passenger pier. The traffic at this gateway is constantly growing, especially due to cruise ship activities. The other sea gateway is the newly opened Blue Marina. According to the Israel Central Bureau of Statistics, Ashdod had a population of about 204,400 at the end of 2006, making it the fifth largest city in Israel. The annual population growth rate is 2.6 percent and the ratio of women to men is 1,046 to 1,000. The population of Ashdod is significantly younger than the Israeli average because of the large number of young couples living in the city. There is also a Scandinavian Seamen Protestant church, established by Norwegian Righteous Among the Nations pastor Per Faye-Hansen. The ACADMA conservatory, a professional educational institute for music and performance studies is based in Ashdod. Operated under the supervision of the Ministry of Education, the institute was established in 1966 and serves as a home for 600 young musicians in different fields. The conservatory is a vivacious and vigorous center of the music and the culture life in the city, and it is involved in the community life and educates a second generation of musicians made in Ashdod. The Ashdod Museum of Art - Monart Centre is a newly opened performing arts center located in the center of the city. The museum has 12 galleries and two halls, and a pyramidal space where cultural events are held. Ashdod's Football (soccer) team, FC Ashdod represents the city in Ligat ha'Al, Israel's Premier League. The club is known for its successful soccer school. The city's top basketball team is Maccabi Ashdod. The men squad plays in Liga Leumit, Israel's second tier league, and the women squad plays in top division. Ashdod plays host to many national and international sporting tournaments, including the annual Ashdod International Chess Festival. The city has a cricket team, a rarity in Israel. It is run and organized by citizens of Indian descent. Like many coastal settlements in Israel, Ashdod's beaches is a venue for water sport, such as windsurfing, yachting, and scuba diving operating in the Marina area. ↑ Table 3 – Population of Localities Numbering Above 2,000 Residents. Israel Central Bureau of Statistics (December 31, 2009). Retrieved June 28, 2010. ↑ International Middle East Media Center. April 14, 2006. From Isdud to Ashdod: One man's immigrant dream; another's refugee nightmare Retrieved December 4, 2007. ↑ Israel Central Bureau of Statistics. Israel in Figures, Population Retrieved December 4, 2007. ↑ City Population. The districts of Israel and all Israeli cities of more than 20,000 inhabitants Retrieved December 4, 2007. ↑ Jewish Virtual Library. Latest Population Figures for Israel Retrieved December 4, 2007. ↑ Ashdod Municipality. Absorption and immigration Retrieved December 4, 2007. ↑ Massoume Price. 2001. A brief history of Iranian Jews Iran Chamber Society. Retrieved December 4, 2007. ↑ PalestineRemembered.com. Isdud, District of Gaza Retrieved December 4, 2007. ↑ Last Days Reporter. 7 Stages of the beginning of Judaism Retrieved December 4, 2007. ↑ Or Barnea. April 4, 2006. Israel Prize awarded to Dvora Omer Ynet. Retrieved December 4, 2007. Josephus, Flavius. Antiquities of the Jews. in English at Project Gutenberg. Retrieved January 18, 2008. This page was last modified on 25 November 2016, at 16:04.